What are the ways we see God’s faithfulness around us every day? How do we live so as to be faithful to Him throughout the different seasons of our lives? 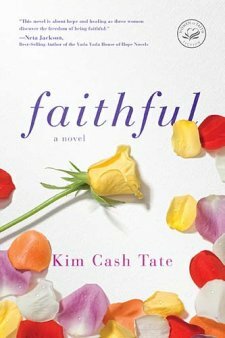 These are questions that the characters in Kim Cash Tate’s novel, Faithful, find themselves asking as each one of them faces new difficulties, joys, and experiences. Cydney is still single at forty, wondering why her life is so different than what she imagined it would be years earlier. Phyllis struggles to raise godly children in an unequally yoked home, facing temptation along the way. Dana discovers that her perfect marriage isn’t so perfect after all and must choose whether to forgive or not in the midst of her pain. I really, really enjoyed this book. I’ve found that a lot Christian fiction contains unbelievable characters, all-too-predictable plots, and a lot of cheese. NONE of this was present in Mrs. Tate’s novel. All of the characters were very realistic, and the issues they dealt with weren’t watered down or dressed up for Christian culture. I got very caught up in the individual stories and loved seeing how Mrs. Tate wove the three friends in and out of one another’s lives, just like it would have played out in real life. While I expected happy endings across the board, I was glad that some things were left unresolved, just like they are in reality.